Automatic machine to load glass sheets, max dim. 3600 x 2600 mm. The machine is composed by N° 3 arms with N° 2 vacuum pads for each arm. The machine is fixed and the glass sheet loading is from 1 lateral rack. 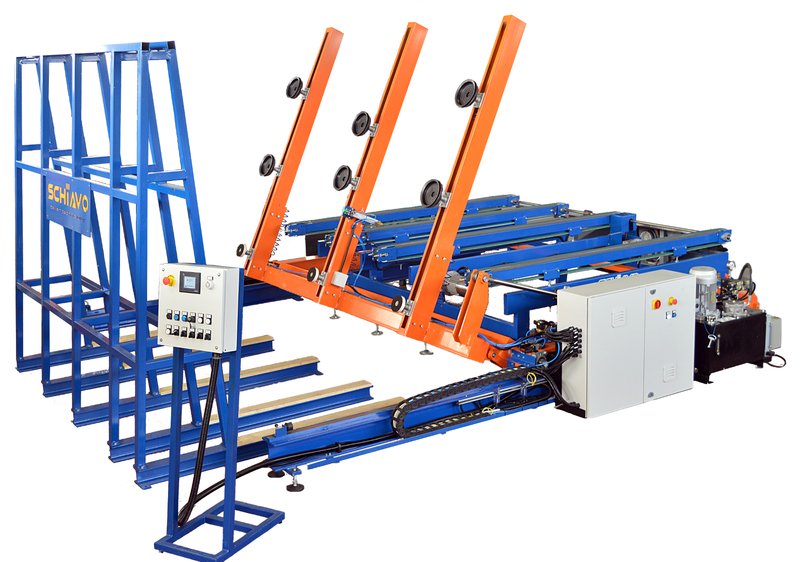 The glass is laid on the machine surface and the wheels are operated by motors with inverter. The loading time is about 60 sec. Electric system with the operator panel aside the machine and all automatic operations controlled by PLC. The basic structure supports steel-made shafts with transporting wheels. The wheels are moved by chain operated by motors and inverter. Hydraulic system for the arms tilting, vacuum pump and electric system are aside the machine. The N° 3 vacuum pads for each arm not adjustable.